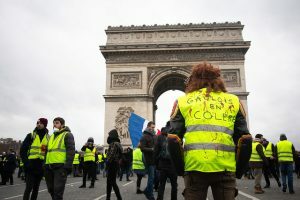 PARIS, Apr 7 2019 – Amid rising attacks on rights campaigners, and mass protests in countries such as France and Serbia, civil society groups are urging governments to ensure the protection of “democratic values” and freedom of expression. In Belgrade, some 850 human rights campaigners, civil society leaders and engaged citizens will meet Apr. 8 to 12 for the annual International Civil Society Week (ICSW) – a gathering co-hosted by the Johannesburg-based global civil society alliance CIVICUS and Serbian association Civic Initiatives, with the support of the Balkans Civil Society Development Network. “Defence of democratic values, civic space and participation, along with citizen action, will be among the topics of discussion,” he told IPS in an email interview while en route to Belgrade. “Our message to governments is that the right to peaceful protest is a basic human right enshrined in constitutional and international law. Governments have an inherent responsibility to enable the right to peaceful protest as an integral element of the defence of democracy,” he added. The ICSW meeting comes at a time when human-rights organisations, campaigners and media workers in many regions have experienced growing repression, including arrests, beatings and killings that have shocked and outraged international observers. “Activists, journalists and people who speak out against growing restrictions are persecuted. A historic rise of populist leaders continues to erode fundamental freedoms, heightening political polarisation and sowing division,” the group adds. Representatives said that civil society and concerned citizens worldwide have started to respond with “renewed determination” to the unprecedented challenges facing the world, and that this resolve will be in the spotlight during ICSW, which includes a large youth participation. “This year’s event in Serbia comes at a critical and opportune time for civil society and the world’s citizens to realise the power of unified, collective action to challenge a global trend that threatens our fundamental freedoms,” said Lysa John, CIVICUS’ Secretary General. The discussions will take place against a backdrop of unrest in various countries: massive public demonstrations have been continuing in Serbia, for instance, while France’s Gilets Jaunes (or Yellow Vests) marched again on Apr. 6 in Paris and other cities for the 21st weekend in a row. This latest French strife began last November in response to fuel price increases, and the demonstrators say they won’t give up until their demands are met for a restructuring of French society so that the “elite” aren’t always in charge. During earlier marches, rights groups such as Amnesty International and Human Rights Watch criticised the French police for using “excessive force” and “heavy-handed” crowd control and anti-riot measures. But some protestors have also participated in violence, looting and the targeting of media professionals, as reporters covering the marches have come under attack. He told IPS that joint efforts had contributed to the “release of journalists and the scrapping of repressive bills that restrict media freedoms” in some instance, while in others the efforts had “helped put serious violations of media freedoms on the UN’s radar through its various human rights mechanisms”. The choice of Serbia’s capital as the 2019 ICSW venue will draw attention to current protests and also recall the bloody recent history of the Balkans, highlighting the need for international vigilance in protecting rights, according to civil society groups. “During the 1990s, authoritarian regimes produced conflicts, severe human rights violations and genocide. Today, as we approach European Union membership, internal and international independent monitoring mechanisms show shrinking media freedoms, a lack of separation of power and rule of law, and deterioration of freedom of elections,” stated Maja Stojanovic, of Civic Initiatives. “This region, and particularly Serbia, demonstrates that changing laws, strategies or governments offers no guarantees – democracy does not exist if it is not built constantly. By hosting this year’s event in Belgrade, we will convene and send messages rooted in local circumstances and, in the same time, fully reflecting global challenges,” she said. Ahead of the meeting, Serbia and four other countries have been added to a global watchlist of countries that have seen an “escalation in serious threats to fundamental freedoms in recent weeks and months”, according to CIVICUS Monitor, an online platform that tracks threats to civil society across the world. Citizens of all five countries (Afghanistan, Saudi Arabia, Sudan, and Venezuela are the others) are experiencing increasing rights violations that “include killings, attacks on protesters, media restrictions and arbitrary detentions of human rights defenders”. “It is deeply concerning to see escalated threats to basic rights in these countries,” said Marianna Belalba Barreto, CIVICUS’ Civic Space Research Lead. “It is critical that these five governments wake up to their failure to respect international law and take swift action to respect their citizens’ most basic freedoms in a democratic society,” Belalba said. CIVICUS is also calling upon “neighbouring states and international bodies to put pressure on these countries to end the repression”.